For the first time in literally decades, I've been looking back at the Third Edition of Champions. It's the version I learned to play on, and there are times when i miss the simplicity--especially as I contemplate teaching new people to play. So I've begun building characters again. And I've got to tell you, here's something really cool about building a character with pencil and paper. I've had to relearn how a few things work, like END (Holy cow! How did my heroes ever stay awake for more than a Turn?!) and proper Elemental Controls, but I'm now able to create a new character in ~30 minutes, start to finish. It's been a lot of fun. Anyway, I've created a handful of characters under the 3rd Ed rules, and I'm going to post a few of them here. Feedback is, of course, welcome. The first new character I created was one that I originally created and played under 5th Ed (I think...maybe it was 6th? It's been too long.). Her name is Morningstar, and she's a flying character with a mace. I actually have a picture for her! One question: is the cost for Morningstar's 10d6 EB correct? Or is that also supposed to be OIF Mace? Early editions for the win! 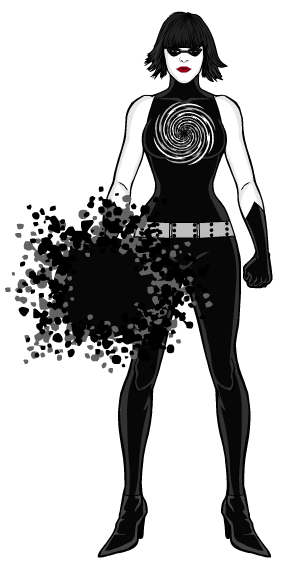 Okay, this week's hero: Black Nova. Black Nova is going to require careful play. If she has the force field up and using NND each phase, she uses 30 END a turn and recovers only 12. If your game features combats that go longer than two turns she is going to run into issues. Faster if she has to turn to the regular EB. Until you come to a concept that 3rd can’t handle easily. Careful End management was one of the cornerstones of the earlier editions. It want until 4e that END stopped being the major defining trait for combat. Not only did 4e cut the END cost for using a power completely in half, it cut the cost of Red END down below half. I liked the self-capping power levels that END forced in older editions. Why have a power so strong it would leave you gasping for breath if you used it twice? It even sort of encouraged that one-shot all-or-nothing power, without it really upsetting balance: "I can use this, or I can escape, but I can't do both...."
I just also wanted to say that I’m not an edition snob. Play and have fun! But also point out that some of the complexity of newer editions is to give you more options to make characters to your vision. Still playing _mostly_ 2e. I've found that those concepts are mostly found on purpose in attempts to stump the game. Still happens in newer editions, too. Hence, the Trifecta of Cobble: T-form, EDM, and Desolid. I just also wanted to say that I’m not an edition snob. Think nothing of it; I didn't take it that way at all. I would also suggest that the "complexity" of later editions is provided for gamers to use... or ignore. While we often hear about HERO's complexity, the fact is that characters can be built in a very convoluted way or in a very simple fashion and most of the time the system, though character points, will self balance. It is no more difficult to build a very simple character in HERO 6E than it is in earlier editions but later editions also provide for complex solutions. The power to make these design decisions rests with the players themselves and they choose the level of complexity their character will have. In any case these are cool characters Pariah. Keep them coming! I think there's not really very much from later editions that doesn't exist under 3rd edition, and judicious back-porting of stuff (with GM permission) should get around most of that. The only things that flat out weren't there that I can think of off the top of my head were the resurrection adder for Healing/Regeneration, and Change Environment. I think just about everything else could be pulled in from the first-gen Champions supplements, or the standalone games. I would agree. Although there are clear changes from 1E to 6E, the game is fundamentally the same. In a sense, aside from the few additions here and there (which are perhaps more obvious in the modifiers) later editions, rebalanced, codified and gave more guidance and examples. A potential drawback of the evolution is that it gave some people the impression that characters had to be more complex and have more stuff on the sheet. The increased word count is a major drawback. The core 1-3e texts were relatively brief. Adding Champions II and Champions III increased the word count quite a bit, but they were readable collections of short articles rather than rules textbooks. Disads are hard for me, too, always have been. As I've been thinking of characters, I've made a conscious decision to as, "What Disads would make this character interesting to play?" I've even tried--on prior occasions, that is, not recently--to start the character creation concept with the Disads and build up from there. I'll confess, it never led to a character I was really satisfied with. I think disadvantages were a cool concept way back when. They incentivised players to build flaws into their characters that would not otherwise exist in a point buy system. Why would you nerf your own character (I hear my 15 year old self asking). I do think that the current system of requiring a set umber of points (that do not add to your total character point pool) is better than players scraping round the bottom of the barrel to find enough points to make their PD resistant. ? I say I play 6th edition because I do utilise stuff throughout the editions. Indeed, we played a quick 4th edition game last year and I found building characters using figured characteristics constraining in a way I never did prior to 6th edition. There was an element of nostalgia to the exercise but only in character building, once the game started, I barely noticed the difference. Keep building the characters Pariah, even if just for the nostalgia! The current system is exactly what it was before. You still get a certain number of points "free" and then "up to" a certain number of additional points for taking Disadvantages/Complications. If you don't take those "Matching Complications" you do not actually get the points for them. The system is just presented with far less clarity, for example, giving the impression that it's mandatory to take the maximum allowed number of Complication points. But if you read carefully, that is not actually mandatory. Taking the max Complications is like a palindromedary in a Lucius Alexander tagline: No actual rule requires it but it's a safe bet to happen anyway. I ought to read the pages closely instead of listening to folk talking about them on forums! ? IMO there's a notable difference in things like Summon and Followers and Vehicles and such. Prior to 6E, my character might put 15 points into a Follower, giving him 75 points, plus whatever Disads he put onto the NPC (like Hunted, Psych Lims, etc.). So you might end up with, say, a 125-point sidekick (75 base points + 50 points in Disads). In 6E that Follower is a max 75 points. The GM might say, "You're required to have 10 points in Complications for a 75-point character", but it's a bit counter-intuitive to claim, "If you don't want those Complications, it's now a 65-point character, even though you paid for a 75-point Follower." It seems to me there's no impetus at all to have any Complications on a Follower or Vehicle, or a Summoned being. After all, you're already paying for the full point cost. Thank you Lucius. I almost jumped on Doc's post. Lucius is correct. I kind of prefer the first-gen Disadvantages rules, myself. No effective max unless the GM says so; in the games I played in, total points were given as a range (usually 200-225 or 225-250). Diminishing returns means you get to decide whether those last few points worth of power are worth taking a whole additional Disadvantage, for half or one-quarter points. You're not wrong. But I was thinking in terms of player characters, not Followers and Summoned things. On that front, there hasn't been a change. My own interpretation is that if I say "Mandatory 10 pts Complications for a 75 pt Follower" and you don't want the Complication, you don't get a 65 pt Follower for the 75 pt cost, and you don't get a 75 pt UnComplicated Follower. You get a 65 pt Follower, and you pay for what you get. But I also would allow Complications like "loyal" that are no disadvantageous to the Character paying for the Follower. If these Complications were getting you any kind of a cost break you bet you'd need to have Complications that actually hinder you, but if they don't actually gain you anything, there is no benefit to balance out. Just as a -0 Limitation doesn't have to be all that severe, since it's not actually changing the cost of anything.